Not everyone has perfect teeth – but almost everyone wants to have a beautiful smile, with great looking teeth. Thankfully, there is good news for people who have unhealthy or unsightly teeth! Dental implants. 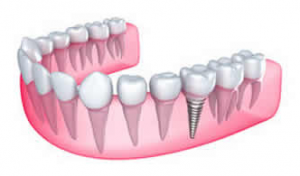 Dental implants give almost everyone an opportunity to have a flawless smile. Below, is information from Dr. Van Treese in Sidney, OH to determine if you are a candidate for dental implants. – People with inadequate gum or jaw bone. – Women who are pregnant. – People who have not stopped growing. – People who suffer from medical conditions like diabetes, immune deficiencies, hemophilia, and more. Typically, implant therapy will require the work of both a dentist and periodontist. The surgery itself will require an oral surgeon, like a periodontist. Initially, your dentist will take x-rays and determine if you are a candidate for implants. This examination will include the looking at the condition of your jaw bone, gums, nerves, sinuses, and more. After this has occurred, your dentist will determine the best course of action. Receiving your implants is just the first step in your process. Once your screws have been placed, you will need 4 to 6 weeks to heal. After you have healed, and underwent a checkup, your new teeth will be placed on your implants. After your new teeth are placed, it is imperative to keep healthy oral hygiene habits that include brushing, flossing, and mouthwash. If you are in the Sidney, OH area and would like additional information on dental implants please contact Dr. Van Treese at his office at 937-492-6984.